This is an evocative statement. It gets at the heart of the matter. However, it leaves out all the different ways that stars make the elements. It is not just collapsing stars, it is merging stars, burping stars, exploding stars, and the start of the Universe itself. Below is the latest version of an evolving periodic table color-coded by the origin of the elements in the Solar System. An original version of this was made by Inese Ivans and me in 2008 and refined and improved by Anna Frebel. Versions highlighting different aspects of the physical processes are available on Inese Ivans’ website. My current version of the periodic table, color-coded by the source of the element in the solar system. Elements with more than one source have the approximate amount due to each process indicated by the amount of area. Tc, Pm, and the elements beyond U do not have long-lived or stable isotopes. I have ignored the elements beyond U in this plot, but not including Tc and Pm looked weird, so I have included them in grey. For this version, I tried to avoid the technical terms and jargon used in the original plot. I also updated the sources of the heavy elements to reflect the current semi-consensus. This graphic draws on an enormous amount of labor from astronomers and physicists. In an upcoming blog post, I will give details on my sources and assumptions for interested parties. Note that this is for the solar system. There will be additional versions showing what this plot would look like if you were in the early Universe, or if you consider the origin of the elements on the Earth, etc. Why does your version have different information than the well-known Wikipedia entry? Here is a discussion of the some of the differences between the Wikipedia version and mine. In many cases, the Wikipedia graphic is presenting information that is flat-out wrong. I am trying to avoid going into all details in this single blog post. The underlined phrases below represent possible topics for future blog posts where I (or colleagues I coerce bribe ask) can go into more in more detail later, including why we think we are on the right track. I will assume that “Large Stars” and “Small Stars” are “High-Mass Stars” and “Low-Mass Stars”, respectively. It does not make sense to think of nucleosynthesis origin having to do with the radius of the stars. As this wonderful graphic from NASA’s Chandra website shows, all stars at the end of their lives swell up to red giant and supergiant stars. In its death throes, a low-mass star can have a much larger radius than a normal high-mass star. Note that the original source cited by the Wikipedia article just has the chart, with no additional information or links that I can find. High-mass stars end their lives (at least some of the time) as core-collapse supernovae. Low-mass stars usually end their lives as white dwarfs. But sometimes white dwarfs that are in binary systems with another star get enough mass from the companion to become unstable and explode as so-called Type-Ia supernovae. 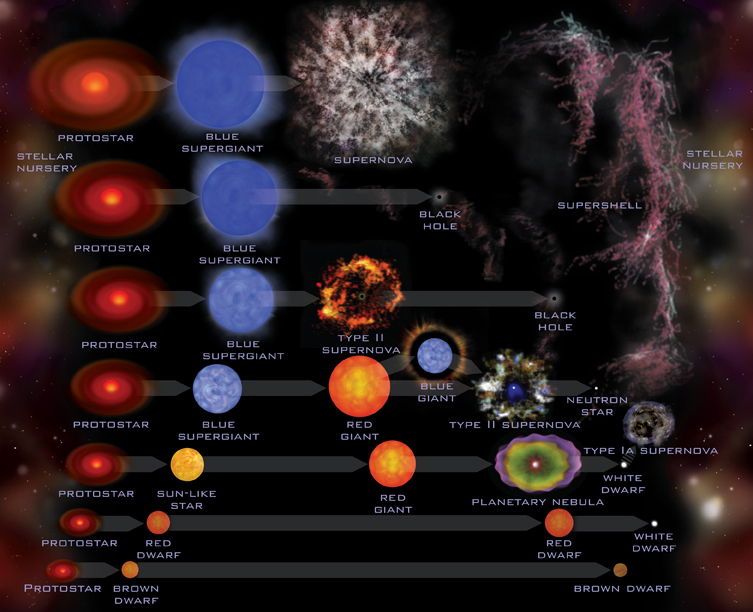 Which “supernova” is being referred to in the Wikipedia graphic is not clear. The interpretation that makes the graphic the least wrong is the “supernova” here means “Type Ia Supernovae” or “exploding white dwarfs” as I call them. I will assume that “Large Stars” refers to the production in high-mass stars both during their lives and during the explosion that spews products of their nuclear fusion into the interstellar gas. It would also be possible to think that “Supernovae” refers to both massive star core-collapse supernovae and exploding white dwarfs. In this case, “Large Stars” could mean that massive stars make it before they explode and the supernovae is just the mechanism for kicking out. These categories are therefore 1) confusing and 2) incorrect no matter how you slice it. Dying low-mass stars (aka “Small Stars”) make substantial amounts of the heavy elements, including most of the Pb in the solar system. There should be a lot of orange in the bottom half of the diagram. I don’t agree that Cr and Mn are made only in “Large Stars”, but Fe is made in both “Large Stars” and “Supernovae”. Basically all the iron in the Universe is made in explosive nucleosynthesis. The iron that massive stars make right before they explode as supernova is all destroyed/collapsed in the remnant. And so on. The information for Li is incorrect. 6Li is indeed made by cosmic rays (fast-moving nuclei) hitting other nuclei and breaking them apart. But most of the far more common 7Li isotope is without question made in low-mass stars and spewed out out into the Universe as the star dies. Some 7Li is also made in the Big Bang and a small fraction by cosmic ray fission. This post does not need to be any longer, but I would like to end by pointing out a difference between the Wikipedia graphic and my graphic caused by the fact that we still don’t know everything. A fraction of the heavy elements, including most of the Au, are formed in the “rapid neutron-capture process“. Where that happens is currently in dispute. It could be in massive star supernovae close to the forming neutron-star. More recently, there is compelling evidence that most of the r-process happens when two neutron stars spiral together and merge. That is why “merging neutron stars” is a category in my chart, but “Supernovae” takes the role in the Wikipedia chart. Backing this statement up with actual evidence may be the basis for a future blog post. Please let me know in comments if you are interested in a blog post on a particular subject. This is what happens when you give two astronomers who are tired of reminding everyone about which elements go with which process a periodic table, a set of markers, and time when they should have been listening to talks. A heartful thanks to Inese Ivans for coming up with this idea. Nice post! You should look into updating the Wikipedia image and/or article! It looks like it has been? The article makes references to categories that are no longer found on the wikipedia image they link to. Hi Paul. Sorry for the late response. I finally had time to update the post with the original NAML figure, which is the inspiration for the old Wikipedia figure I was complaining about. The post should make more sense now. Thanks for the link. A quick correction: SDSS is not funded by NASA. We are mostly funded by our member institutions, with some contribution from the US Department of Energy. Very nice, very good work. I’ll ask you to also add the short-lived isotopes. I think it’s interesting where they are formed despite being impractical, and for completion issues. I am also very curious about the source of heavy elements. For example, are Np and Pu missing on the wild because they’ve already fizzed away or have they been never created on nature? Thanks for the comment. I will put “discuss the formation of the short-lived (including trans-U elements)” on my blog to-do list. I understand your reasoning for using NS mergers, but that suggests that supernovae (II) don’t play a significant role for the neutron-rich elements. I wonder if it would be worth replacing that with simply “r-process”, considering the current debate about the site, although I agree that at least at high metallicities the arguments for the NS mergers are becoming rather compelling. But maybe r-process will be too technical? On the other hand, labeling those elements “r-process” would underline that we don’t actually know the site yet, which I would consider an important point, that you also highlight above. Then people are free to go look up the r-process and check out the different candidates. Thanks for doing this work once again, it’s great! Hi Anders! I agree that the vermilion color would most correctly be labeled “r-process”. But that’s not so helpful to people who are not us & that was my main goal. However, will make a revised version with “merging neutron stars?”. Hooray for question mark! Would you like to write a guest post about the r-process and the current debate on its site for this blog. I would love to have other experts chime in here. I look forward to making a truly revised version when we know where the site of the &%#()$@^ r-process is. Your version of the origin of most lithium (table and 4th bullet point above) conflicts with http://www.cosmic-origins.org/PAGES/ptable1.html, The Main Nucleosynthetic Origins of the Dominant Isotopes, which gives it as cosmic ray spallation. The conflict still exists even in the more detailed tables on Ivans’ site. Yes, good point. I will chat with Inese and see why we disagree. I think I am correct (obviously), but could learn something! Excellent blog. Thank you for all your work. Great job! Is this periodic table available to purchase anywhere? I would love one for my classroom. We begin our exploration into chemistry each year by discussing stars and where the elements come from. We obviously do not go into the level of detail you do in our high school chemistry class, but it would be a wonderful poster for students to see. It’s a small amount, but you left out isotopes produced via manmade or natural fission. See http://www.science.uwaterloo.ca/~cchieh/cact/nuctek/fissionyield.html , for example. I did that deliberately! Thanks for the reference, will point people there. So, since Wikipedia is rather wrong in this… are you willing to allow this to be shared as CC-BY or CC-BY-SA for use on Wikipedia? Yes. But I want to fix a couple of things first. I still prefer wikipedia for my outreach work. I am going to put it under a Creative Commons license ASAP. Does that sound good? Awesome! Great work, keep it up! Not the main elements in the human body. Just the origin of the elements in the solar system today. No Tc or Pm in the solar system today not created by humans. Thanks for sharing this – a great diagram. Any feedback / corrections welcome. Pingback: This Amazing Periodic Table Shows The Origin Of Every Atom In Your Body-We Are All Made of Stars! Maybe I’m confused, but if Inese Evans was part of making this table why do the annotated origins differ so much between this table and the ones found on her website? For example, you note that O –> Rb is only from explosive events, whereas http://www.cosmic-origins.org/PAGES/ptable3.html has no references to explosive nucleosynthesis above Ge (As->Rb is put down as mainly r-process)? I was trying to be less technical, so I went with our current best guess that the “r-process” comes mainly from merging neutron stars. But we aren’t sure yet. But we are 100% sure that the neutron-capture had to be “r”apid. We also aren’t quite sure about the Ge–Zr region. Again, I took what I think is the best guess we currently have. I had Merrill’s old office at the Carnegie Observatories as a postdoc, so I am planning that one post in this series will about his Tc discovery, including how low-key the paper was. Not obvious from the title how important this discovery was! So Tc will get some love, as it is one of the key pieces of evidence that we are on the right track. Pingback: This fascinating NEW ‘Periodic Table’ explains the cosmic origin of EVERYTHING - Social Lay- viral on social media Trending news and photos from Facebook. Do you have a printable version? Many students and teachers do not have funds to expend on deeply saturated images and black backgrounds. Maybe I missed it but I would LOVE a chart WITH all the technical jargon and precise processes involved (like the original marker version but cleaned up). Also, if you include the trans uranium elements and mark them correctly (produced in supernovae) it would look complete. Is the periodic table of elements applicable throughout the entire universe? I am working at a Publishing house in France. We would like to reproduce your periodic table in a book about astronomy, would it be possible? Please feel free to contact me if you want further informations. What is the definition of a “dying low mass star”? Jennifer, I’d love to print these for use in our high school classrooms. There is a 3000×2100 resolution PNG format file on your Ohio State site. Do you have a higher resolution image? I want to go BIG! Larger than 29″x42″ current file. Is it possible to have a cleaned-up version of this Periodic table? Those are 3 points that need to be adressed to make this a good looking periodic table. Then there are details like aligning the text-blocks. the “merging neutron starts” block seems to be shifted 2 pixels to the right as well as “exploding white dwarfs” (3 pixels).